Join the ANCIENT LAKES mailing list TODAY! C+Salts now available in capsules! Rich in antioxidant vitamin C to provide immune support, help manage fatigue and protect from free-radical damage; with 88% RDI of wholefood vitamin C per capsule. additive-free, BP grade potassium chloride for normal water and electrolyte balance and to support muscle function. C+Salts Kakadu Plum Mineral Support uses only refractance dried Australian Kakadu Plum; a method which retains its full nutrient profile. Our Kakadu Plum is sustainably harvested by Indigenous communities across the Top End of Australia and supports their economic independence. Contains only: Natural Australian Lake Salt, Potassium Chloride, Kakadu Plum Powder (Terminalia ferdinandiana), Hypromellose cellulose (vegetarian capsules). take 1–2 capsules morning and evening. * Heat, intensity and duration can affect your needs for fluid and electrolyte replacement. Best used regularly throughout your exercise regime. Consume up to 3–4 capsules per litre of fluid. Maximum daily intake: 8 capsules. Do not consume with electrolyte drinks without specific advice of your medical practitioner. Formulated supplementary sports food. 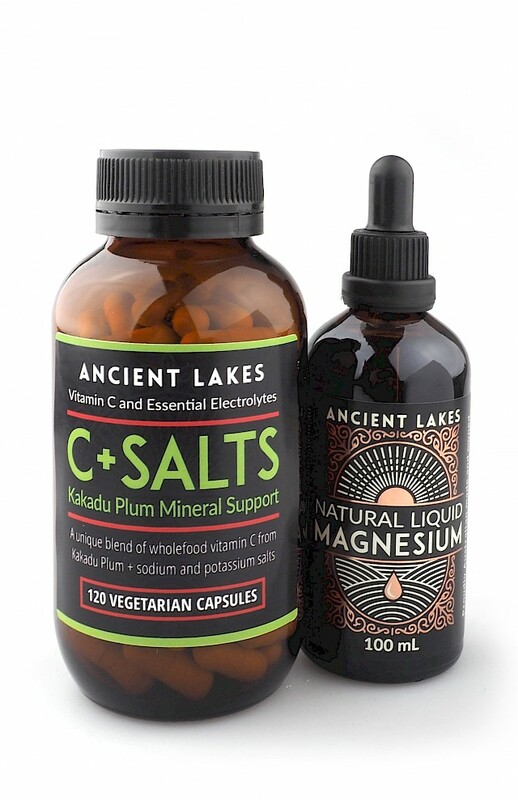 Ancient Lakes Magnesium C+Salts are not a sole source of nutrition and should be consumed in conjunction with a nutritious diet and appropriate physical training or exercise program. WARNING: Not suitable for children under 15 years of age or pregnant women: should only be used under medical or dietetic supervision. C+Salts Kakadu Plum Mineral Supplement is ideal to use in combination with our Concentrated Ionic Magnesium for essential mineral balancing. Ancient Lakes C+Salts Kakadu Plum Mineral Supplement provides unique blend of wholefood vitamin C from Kakadu Plum plus essential sodium and potassium salts for vitamin C and electrolyte support.